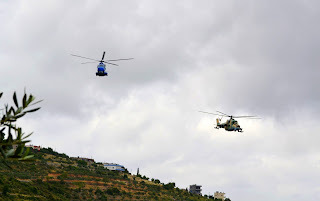 Since the beginning of the Syrian uprising, only few times we could see the naval Mi-14 in action, not only over the Syrian shores, but even inside. In media, the first time a SyAAF Mi-14 is spotted in action when it was flying -said to be heading towards Aleppo area- over Bennesh in Idleb province, that was on 14 Feb. 2013. The second photograph of such type emerged recently on web when a unit together with a SyAAF Mi-25 were both flying over the house of a SyAAF pilot in the suburbs of Lattakia who was KIA in this uprising as a soldier-greeting to his family. 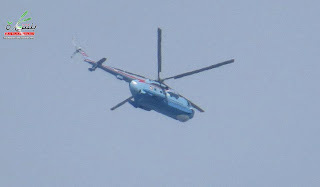 This video is for the same Mi-14 photographed above (first photo). It was videoed again in Idleb province, this time flying over Jabal Azzawiyah on 26 Feb. 2013. Another time this type was seen over Jabal Al Akrad in Lattakia suburbs on 9 May 2013. An UPDATED LIST of aircraft and air vehicles spotted over Syria since the beginning of the uprising till this night, those I collected from YouTube and listed in one document to share with searchers, observers and analysts. - An enormous use of UAV's over Damascus area, especially over Eastern Ghouta (Darayyah, Saqba, M'addamiet AsSham...etc). - SyAAF conducted only few air raids over Deir EzZour. - It is fixed that SyAAF is only using MiG-21's and 23BN's over Damascus areas. - While the Su-22's and 24MK's are being sent over Homs, Idleb and Aleppo areas. - For the first time a Ka-28 is spotted somewhere over Lattakia province. Dhab'a (Qsair AFB) is RED again.